>My mind has gone elsewhere. I’m finding it increasingly difficult to concentrate on riding the bike hard (at all). This is not surprising – we’ve started the process of trying to sell the house and I might be starting a new job in the next few days. All of this, together with a bit of drizzle, some cold mornings and the cumulative effects of a long season, have pushed cycling down the agenda. Which is fine. So anyway, I thought “why not use this physical down time – with its inevitable decline in performance – to address some technical issues that need looking at”. That’s what I thought. The above picture is from last week’s ’25’. It shows me straining away at the bike, head down and helmet tail up. What you can’t see is me climbing all over the machine trying to wrench the gear round. This is inefficient (if quite effective) and, more worryingly, tends to move the bike from side to side. I am becoming a danger to myself and other road users. So for today’s event – a Westerley CC club ’25’ on the HCC114 ‘junkyard’ course from Great Missenden – I thought that I would experiment. I would try to ride smooth and straight, upper body locked in position, and, if possible, keep the revs higher. It was a cold and breezy morning. The first time since the Spring that I’ve worn long-fingered gloves. My resolve was tested in the first three miles (slightly uphill and into the wind). But I kept solid in the saddle and kept a straight line (apart from dodging a few of the worst potholes). I went very slowly though – it felt as if my hips had nothing to push against. The style seemed to work better with a tailwind, but I reached 10 miles (where I packed) in 26:32 where I would normally do a short to medium 25:** on this course. My cadence was low as well – it wasn’t easy to pedal fast. I need to work on core strength this Winter. I also think I need to tweak my position. Race stats (for the first 10 miles): Time: 26:32 (22.61mph). First 5 miles: 14:15, second 5 miles: 12:17. Top speed: 30.0mph. Slowest mile (2): 3:04 (19.57mph), fastest mile (9): 2:09 (27.91mph). Average HR: 157bpm, maximum HR: 162bpm. DNF. Ave. cadence: 72rpm. 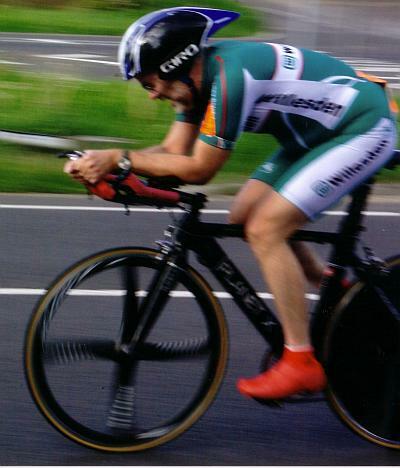 Posted on September 26, 2010, in Cycling, House, teaching, time trialling. Bookmark the permalink. Leave a comment.